I cannot rave enough about today’s recipe. Outright delicious! Chicken and methi complement each other really well and I’m eternally grateful to the origins of this recipe. The key to this recipe is in the caramalized onions that are pureed along with curd forming the base of this creamy dish. An ideal do-ahead lunch/dinner party fare. 1 Make a paste of browned onions and curd (yogurt). Keep aside. 2 Heat 2 tsps oil in a cooking vessel, add the methi leaves and saute for 7-8 mts or till they turn crisp. Remove and keep aside. 3 Heat the remaining oil in the same vessel, add ginger garlic paste and green chilli paste and saute for 3-4 mts. Add turmeric pwd, red chilli pwd, cumin pwd and coriander pwd and combine. 4 Add the tomato puree and cook for 3 mts. Add the onion-curd paste and cook for another 3 mts. 5 Add the chicken pieces and combine well. Cook on medium high flame for 3-4 mts. Reduce flame, place lid and let the chicken cook till three fourth done. 6 Add the cashewnut paste, garam masala pwd and sauteed methi leaves and combine well. Add few tbsps of water if necessary at this point of time. Cook till the chicken turns soft and you get the gravy consistency of your choice. It should be a thick creamy gravy. 7 Turn off heat and serve hot with white rice, biryani, flavored rice or rotis. Nice Recipe. The combination of chicken with methi always comes well. Thanks Sailaja garu. Amazing recipe, my hubby who is a foodie loved my methi murgh. Thank u.
ahhhh sailaja garu…..mouth watering dish.bowl ni foto lo nundi theesukoni thinalani vundhi. WOW… no words to describe how delicious it looks. Wow sailu….thank u very much for this mouth watering recipe. adigina ventene post chesinanduku…. I’m feeling very happy. Even though…I dont eat chicken….the curry is looking very tempting. I will make it for my kids. And sailu….ur idea of adding methi in chicken is very good and it is also healthy …I think. Becos…as chicken is said to increase heat in body….at the same time methi balances as it has cooling properties. I hope…I’m right. Bye sailu….and sailu thanks a lot…at last u have updated KZ. Why do you soak methi in salt+sugar water? To reduce the bitterness of methi leaves. The dish is looking very good. I am a eggetarian. Can we replace any vegetables for this? Sure you can. Both eggs and mixed vegetables will do. If using eggs, lightly saute them in 2 tsps oil and follow rest of the procedure. If using mixed vegetables, saute them with enough ghee+oil for 7-8 mts and remove. Follow rest of the procedure. Thanks Sailu. Wish you had blogged about the tomato coconut rice as well. Sorry I am a very greedy fan of your posts. You made my christmas and new year party planner easier. Thanks a million once again. Nice recipe. I tried your chettinand chicken recipe. Initially others in my house were not too keen on eating a chicken recipe with curry leaves tadka, but then the taste changed their mind. It was finger licking good!! Next I am going to try your Holiday/Rum Cake. I notice in the above pictures you show a Tomato-Coconut rice. I would love to have the recipe for it. Yes, you can use paneer. Saute paneer in oil till lightly browned and follow the above recipe. Wow..What a fantastic site. I am your great fan. I am a beginner in cooking and this site is of real great help. keep continuing this good work. The chicken looks amazing. Will definitely try this weekend. Can I add spinach instead of mehthi. Once again..thanks!! Anitha garu, You can use spinach too but then it will go in a totally different direction in terms of flavor. Methi lends a unique flavor to this recipe. Wonful recipe yet again.My Mom-in-law is an extensive user of methi leaves .. So when I was staying at their place, I ve learnt to use methi as much as I can. May sound funny, but I use methi even in pappu chaaru that we make everyday. My mom used methi only in dal or when she made gobhi methi which is her special dish. Yeah I used it in Chicken curry but that was a simple chicken curry with a tomato gravy. Your curry as usual looks very delicious…will try soon. Thanks a bunch. By the way I came across a nice site recently .. may be U already know abt it.. But just thought U might enjoy it as much as me…its vahrehvah.com. I like the ‘video collage’ very much. I am sure, you must be knowing all the recipes listed..but just thought u might enjoy watching them,..Thank You.. Take Care. WOW! What an awesome pic to match the awesome prep….. I love the way u have presented it rather captured the awesome prep…. The beautiful bright colors on the background…with the richness of the delicacy itself… It is totally tempting….. Gr8 Going!!!!!! I am a regular of your blog. I tried the chicken methi today and it was excellent. Thanks for sharing your time and recipes. yeah good, its mouth watering. Lovely recipe and lovely presentation. i tried to make chicken twice but somehow those spices didnt blend well with chicken. i made it with rice, rice was good but chicken tasted just soft and no taste. i cooked twice but i am missing something. can u correct me on that. we like chicken i am eager to make it best. Kranti, which recipe are we talking about here? Didn’t quite get you. Why do you add cashew paste? Is it to make the gravy thick or to reduce the spiciness/ effect of chillies and Garam Masala. Instead I feel you should add coconut and Khus Khus paste. That gives a different taste. I followed the recipe (from my recipe files) which is of North Indian origin to the ‘T’. Cashewnut paste lends richness and creamy consistency to the dish. I tried your recipe it came out good. But i didn’t get the same colour of yours? I used kashmiri chilli powder..
Do I need to use any other chilli powder for bright color? I am not sure why you have not been able to achieve the same color. I guess, it depends on the other factors like how well the onions are caramalized, turmeric pwd, chilli pwd and color of tomatoes. I have used home made chilli pwd using red chillis that are used to prepare pickles. I followed the recipe (from my recipe files) which is of North Indian origin to the ‘T’. It lends richness and creamy consistency to the dish. Prepared the dish with paneer in the morning and blogged it (http://kavithabhargav.blogspot.com/2009/12/methi-paneer.html) immediately. Thanks for the wonderful recipe. Hi Sailu, Thanks a lot for this awesome recipe. We tried and liked it a lot! I need your advice on making another dish that was utter flop when I tried. I marinated Chicken breast pieces in curds, lemon juice, chilli powder, dhaniya powder, graam masala, Kasoori methi, salt for 1 full day. Then I took it out of fridge and fried it on wide open pan on high as lot of water was oozing. I continued frying on till the water evaporated and then lowered the flame and closed lid thinking that the flavors will set in and the oil might separate. But not only did oil disappear but also the chicken pieces became extremely dry! I was very disappointed. Can you suggest how to get soft and tender chicken pieces? Is there any ground rule that always helps to get soft chicken pieces? Stars, you need to use chicken with bones when you prepare such dishes. Breast pieces will not work. To get soft chicken, marinate for at least 4-5 hrs and do not over boil the chicken. I also did not get the color strangely. I was wondering if the quantities (such as a tsp or tbsp) used in your recipe are measured using a measuring spoon or do you just eye ball them? The reason i ask is a tsp of anything measured using a measuring tsp is very little when compared to the spoons we use in india. I would really appreciate if you can let me know. Tara, most of the recipes are by way of ‘andaz’. I will do a post on tsp and tbsp and cups used by me. I have had many readers asking me the same query. I am from Malaysia and I love reading food blogs and trying out recipes. 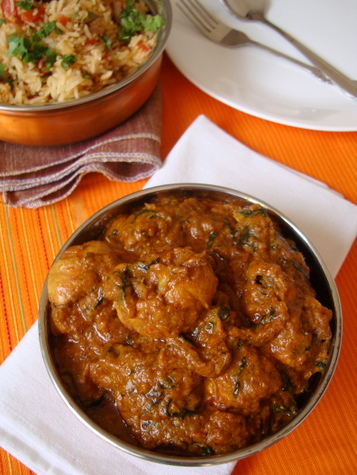 I want to try the methi-murgh, however we dont have fenugreek leaves here. What can I subsitute for the leaves. Thanks for all your lovely recipes and should I try your recipes, I will certainly post a comment. Meanwhile, happy new year to you and all your readers. Happy New Year, Tamenthi. You can use dry methi leaves called Kasuri Methi. Use about 5 tbsps for the above recipe. The use of dried methi leaves in the above recipe will differ in flavor compared to fresh methi leaves. Happened to reach your blog as I got the reference from Shilpa’s Aayis Recipes. Your blog is simply fantabulous. I am a mother of twin girls and am grateful to have chanced upon your Kids Zone site too… I extremely appreciate your effort in putting up these blogs together, admire you for the patience you are having in answering almost all the queries of your readers keenly. I even checked Suvastra site. You are an all rounder!!! I tried the Methi Murg recipe and it was simply awesome. I would like to post the recipe in my blog with your kind permission. Will try more of your recipes and let you know. Keep up the good work. I tried this recipe and it turned out awesome, myself and my husband both loved it so much and did enjoy the dish very much. Taste is wonderful i just fall short of words to explain how nice it was. “Rangu Ruchi Chikadanam anni sarigaa saripoyayi” Thanks for the recipe. I did try a few of your other recipes including Chegodilu, Gobi Manchuria, Aloo Methi, Tomato Chutney to name a few and all were successes. Never had any flop shows. Thanks to you and keep up the spirit. hi .. i tried this, it wasn’t so tasty as ur usual andra non-veg recipes..
hi sailu..i have tried this sailu..it came out very well….thank u so much. sailugaru, methi chicken try chesanu..It came out well. I followed exactly as you mentioned. 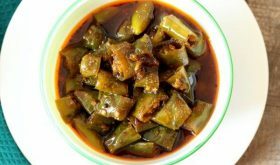 Me recipes chala baguntai ..Nenu chala try chesanu meevi. Epdu upset avvaledu results tho.They always came out well. tried out the recipe looking at the tempting photo and the dish turned out really tasty .thanks for the recipe. some of my recipes are there too, I have asked the administrator to remove them. I tried this recipe and i am happy with the outcome. its just that i did not get the same color and was a little disappointed by that…and i cooked in medium heat rather than the low you mentioned and the chicken did not cook properly….i will give it one more shot…please let me know about the color variance though…. 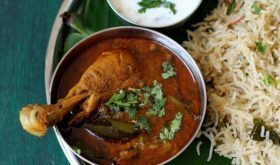 hi sailaja……i tried out this recipe n it was absolutely delicious n different from the regular chicken curry…thank u …waiting for more recipes!!! hi sailaja i tried this recipe yesterday and it came out good.thank u for posting good recipes. Good! I tried it today and it came out just like the pic you posted. I think its the cashews that thicken the gravy – im going to try and use cashews in other veg recipes also to thicken it. thnx for the recipe. Sailaja garu wat a mouthwatering recipe madam. Aiyooooooo. Its awesome to see itself. M going to try tis tmrw itself. I have tried all ur chicken recipes, all had been super hit. Delicious. Pls tell me how to prepare chilli chicken with green chillies. Its a request. Awesome work by u. It looks really delicious but where can I get the methi leaves? I’m from Malaysia. Please let me know. Thank you. Today I tried your Butter panner recipe. And it turned out very well even though I didn’t use blender. This is the first time I cooked panner. I got it from supermarket. I like it but the cubes became slightly bigger when I cooked. It’s not that hard. Is all the panner should be frozen? They are fenugreek leaves, Gangka garu. 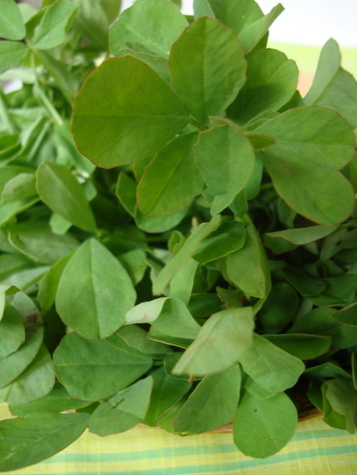 Is there any substitute for fenugreek leaves? In case, if I couldn’t get them…Please suggest. Thank you. You can use dry fenugreek leaves called Kasoori Methi. Use about 4-5 dessertspoons of dried leaves for the above recipe. can i try this dish with boneless chicken, do i need to precook the chicken first. pls advise. 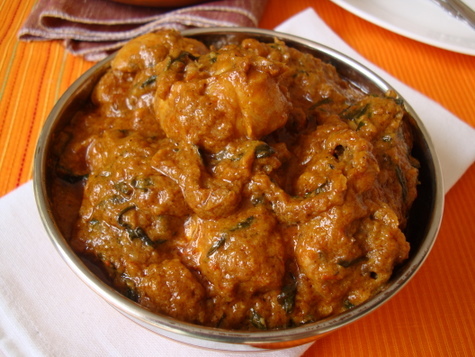 Chicken with bones works best for this dish, Rati. No need to pre-cook the chicken. Follow the recipe. 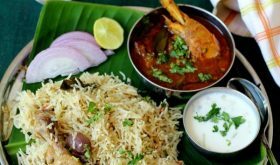 your recipe looks fantastic.today am doing hyderabadi dum biriyani…want to make this as the curry to go with biriyani…hope it comes fine.got to go and look for fenugreek leaves..am staying in kl,malaysia…keep posting new recipes.. Your methi chicken looks great. But why do you want to cut down on the bitterness of the methi leaves? Isn’t that what adds to the flavour? I do a methi chicken too but differently. That too is delicious. I buy 1 fresh chicken, deskinned and cleaned. It weights approx 1.5 kg. We do not get any other size from the shop I buy from. caramalised means dark brown? are they to be partially brown or fully brown. I am worried I may burn them. Just how do you know when they are carmalised. Sarita, you do not have to double the ingredients, just slightly increase by ‘andaaz’ (eyeball). If recipe calls for 2 onions, use 3. Caramelizing onions is sauteing them beyond the ‘transparent’ stage but not black. They have to turn brown. I have put up a picture of caramelized onions in Hyderabadi ChickenDum Biryani post. keep the good work going…all the best!! I have tried many recipes and it turn out good.I planning to try out this recipe but I do not want to add yogurt.Could you please tell me with which ingredient I should substitute it. Your recipes make me hungry. Blend the curd and onions to make a paste. I have been cooking your recipes for a while now( I learnt a lot of cooking from your site to be frank ).. But this methi chicken is definitely cream of the crop for me… It came just so awesome, that I couldn’t refrain myself from commenting… Thank you sailaja garu thank u soo much 🙂 keep posting keep posting good tips and recipes! I have a question about ur recipe.When u say caramalised onions,do i have to saute the onions in low flame till its soft & caramelised or do i have to fry it till is brown and crispy(just like we do for biryani)? Thanks for the recipe anyways. You fry them a little less than you would for biryani. They do not have to be very brown and crispy. But you need to fry them really well. I prepared this and it came out so delicious. It is really a winner with rotis. Like you responded in one of the comments, it is North Indian to the ‘T’ – which sometimes I find it quite tricky to make on my own. Whatever I make tends to be invariably southie in flavor. so I was quite excited by the results of this. The methi does lend a distinct taste. Thank you for sharing the recipes and such detailed instructions. 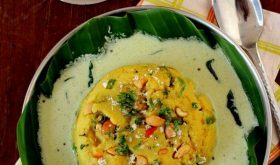 I had tasted this dish in a restaurant just a week back and it was yum…Could not get the taste off my mouth…have been searching for the recipe and here it is!Thanks a ton for this mouth watering recipe..will try it this weekend for sure! Sailu, thankyou for sharing this magic recipe with all of us. I tried out this weekend and my familu just sweeped it away and I really wondered where did the curry go 🙂 . Looking forward for more of such recipes. Hi Sailu – I am South African of Indian origin.My and my husbands family came from Andhra Pradesh about a 130 years ago.During this time the cuisine eaten by us has changed quiet a bit and we only cook a few Andhra dishes.I am so glad to have found your site so that I can now practice some authentic Andhra cooking which my Telugu forebears have brought years ago. As i told you earlier, I tried this on Monday and it was awesome!! It was a very big hit. All of them are a fan of it now. I will be making it very frequently. Mouth watering recipe!! Thanks for the post. I tried the chicken methi on sunday meal and it was excellent. Thanks for sharing this recipe. Looking for more recipes. This took a tad-bit of prep time, but the results were well worth it. Enjoyed the dish, and menthi kura is definitely growing on me! I am not a keen blogger myself, but am definitely a foodie. I really, really liked this methi machi dish from Avisha at SimplySindhi recipes, and have a feeling you might like it to. Do give it a try if you can Sailu! I tried the methi chicken yesterday, and it came out great. I will be making it again soon for my guests. I added the dry methi leaves together with the cashew paste and did not fry it. I guess the fresh ones need frying. You bet will try your other recipes. Thank you once again. God Bless. a very nice recipe. 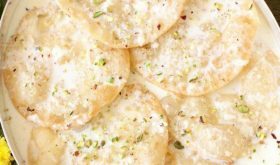 I tried it and it was liked by everyone at home….thanks for such a wonderful recipe…. I made it for the first time following your recipe.. Came out absolutely delicious. Thanks so much. Plannning to replace chicken with paneer for my vegetarian friends and see how it comes out. Thank you for posting this marvelous recipe. This reminds me of my mothers home cooking back in India. I intend to make this recipe but I have a nut allergy..could I leave out the cashew nut paste? would it suffer in flavour a lot? I just tried this curry and it was awesome. Thanks for a wonderful recipe. This is a wonderful dish (every one of your other dishes I have tried so far have been). I originally tried it with fresh methi. We don’t always get that around here. Dried methi (Kasoori Methi) works almost as well. how much kasoori methi do you use? how many teaspoon of garam masala to add? 1/4 tsp garam masala will do. this is awesome post i like this a lot you are too good. You have not included the yoghurt in your method although it is listed in ingredients. You have also not given a quantity for this ‘curd’ in the ingredients. These points make following the recipe accurately difficult. Sorry for the inconvenience. Curd and yogurt mean the same. Great recipe! I have discovered fenugreek leaves recently, and I love how it enhances the flavour! Maybe you can try my recipe too! Hi, this is a wonderful recepie… i have made it today… n everyone just loved it!!!! thx for such a great recepie!!! I tried this out, this came out well. I however would want more gravy.. Actually by the time the chicken cooked the masala had dried up. I used the exact quantity of ingredients as you mentioned here. However there wasn’t much gravy.. The taste was excellent.. But my family wants with a little bit more gravy.. What do I do to have more gravy? Do you suggest adding water, if yes when do I add water, or do I boil the chicken separate and then add it along with the chicken soup at the same time when you add chicken to your recipe? Please confirm. made this twice so far – came out delicious each time! I just made this with my husband as my sous chef, delicious! Added a few sheets of seaweed for umami. Yum, thanks for the recipe. Thank you for the recipe :). it sounds wonderful so i am going to try it. I have a qs though about the onion. If I have already have caramelized onion, how much should I add? Any idea? Maybe four tblsps or that’s a lot? Also how much garam masala powder? Your help be appreciated :). Thank you again for sharing this with everyone. Thanks for the awesome recipe….everybody enjoyed it to the fullest..:) loved it!! Spotted methi leaves on sale near ,me for the first time this week – have always used dried before – so I bought a bunch and then went looking for a recipe to use them in. Found this, and have just cooked it – it’s really, really good – thanks so much! I tried this recipe. It turned out great but a little sour as I had used tinned tomato puree. Is there a quick fix to it. Will adding some coconut milk help or should I add some more cashew nut paste to reduce the sour taste? Is it ok to use Almond paste instead of cashew paste? This was reallly tasty!! Although I used the measurements for 500 gms boneless chicken breasts. But great recipe.. thanks a lot! I am a vegetarian and this was the second or i guess third chicken recipe i made for someone. It was amazing. Adequate amount of spice and a yummy flavour of crispy methi was infused in the chicken. It’s different. This dish was a super hit in my house. I have been cooking methi chicken since quite a long time. But nothing like this. I think fresh crisp fried methi & caramelised onions are the secret behind its awesome flavours. Cheers..
1/4 cup yogurt. Use whole leaves. I have made this so many times now and everyone likes it sooo much. It tastes awesome especially with jowar rotis north karnataka type ones and with chapatis.